A system of sand dunes runs from Perranporth to Newquay which results in most beaches along this stretch of the coast not being fully covered at high tide. The Cornish name for Newquay even means "wind blown dune". The town is small enough to be explored on foot and the surrounding area of small villages and beaches has a good network of footpaths. A circular walk through the poppy fields of West Pentire to Polly Joke beach, returning over the headland to "the pink pub" that was a cowshed until the mid-20th Century. A circular walk from St Newlyn East through the woods of the Lappa Valley where the Steam Railway now encompasses what was one of the most famous mines in Cornwall during Victorian times and the riverbeds are still stained red. A one-way coastal walk, made circular via an initial bus journey, from Holywell Bay along the coast and Gannel estuary to Newquay, passing the beaches of Porth Joke and Crantock and the headland of West Pentire where there is a spectacular display of red-and-gold wildflowers in June. A circular walk from Holywell Bay along the rugged coastline to Perran Beach and across the dunes to the Dark Ages relics of St Piran's Oratory, Church and Cross, returning via the Penhale Sands nature reserve which is carpeted in cowslips during spring. 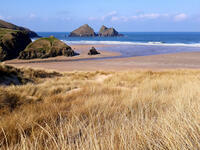 In Newquay itself there is the Newquay town and headlands walk and the Crantock and Gannel walk is also close by. Coastal walks to the north of Newquay include circular walks from Watergate to Porth and at Bedruthan Steps, and one-way walks using the bus from Watergate Bay to Newquay and Porthcothan to Mawgan Porth. To the south of Newquay, there are circular walks from Holywell Bay to Crantock and a longer one from Holywell to St Piran's Oratory. There are also some circular routes inland of Newquay, particularly around St Columb Major and Goonhavern.